Society today is focused around technology and almost everything can be done via computers & smartphones. You can painlessly access almost anything with the touch of a button. With that in mind, it has become increasingly difficult to keep our little ones from watching TV, Netflix, playing games (for fun & educational purposes) on the iPAD, iPhone, iTouch, Android, Nook, Kindle, etc. My 2 year old daughter can probably work an iPad better than some adults, lol. One morning I left her to sleep with daddy while I dropped big brother off and she crawled out of bed and just entertained herself with Netflix “just for kids” while daddy slept. I got home soon after and asked her what she was doing and she’s like “just watching my show on the iPad mommy” I thought it was so cute and smart how she managed to unlock the device & navigate through the icons. With all this available to them, it is so easy to over-stimulate their brains which over time can cause difficulty concentrating and/or focusing on completing a simple task. I am not against exposing my kids to technology because I do believe they can learn from it, but as parents we should be aware of what they are doing & how much time is being spent on these devices. I am guilty too! My kids have watched more than one episode of Dora in a day, but sometimes it’s tough to get things done without giving them a TV break!! If you do decide to put TV on for them, then I suggest communicating to them that they are to watch X amount of TV and give them a five to ten minute warning before you turn it off (to avoid any possible meltdown/tantrum). So in lieu of TV time, I wanted to share with you an activity that can hone in on their concentration & focus. Both my 2yo & 4yo love to play…LEGOS! Although expensive, it is a great activity to get their little minds focused. My husband calls it “the non-ADD” activity because it requires their undivided attention and when you get to the more intricate sets it becomes even more challenging. If your child is young (1+) you can start with the big blocks and move your way up to the duplo sets…and then the sets with the teeny, tiny pieces. My 4yo puts together the 6-12yo sets with very little guidance from daddy. We sit him down at the the dining table and he begins by grouping all the pieces together by color (which takes time) then he grabs the instruction manual and goes page by page piecing it together until he is done. Once he is done he is absolutely thrilled and so happy about his final product. It is a very rewarding project because from 100+ scattered pieces it turns into something totally functional! My 2yo daughter loves to build towers and big brother helps her to make things she would not think of which also indirectly nurtures the sibling bond (double score!). 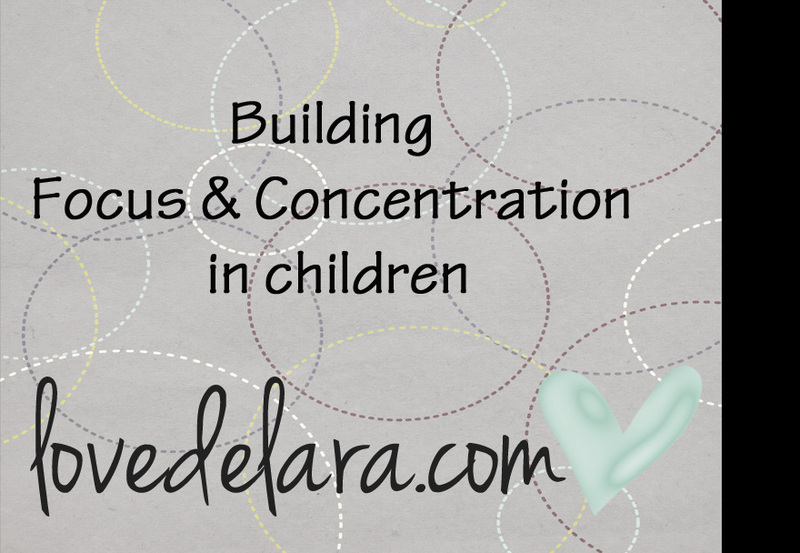 If Legos are not in your budget (because it can get costly), there are many focus & concentration games available that are free! I was researching online and came across this great article: http://www.empoweringparents.com/Five-Simple-Brain-Exercise-Activities-for-Your-ADHD-Child.php# (which is by the way a great website with helpful tips & tools for parents). The article gives you ideas on activities you can do with your child to help increase their focus. I think my son would love to do the coin game! I am excited to try it with him, God willing. Regardless of whether your child has ADHD or not (since the article is talking about kids with ADHD), this article has some great activities any parent can use. The more we put our children in front of TV the higher the chance of them becoming easily distracted when trying to complete tasks (which may lead to behavior issues in school, ADD characteristics, etc.). Ultimately, God is the best protector and I put my trust in him. If we do things in moderation (as God says), then we should not have a problem. Excess in anything becomes problematic, so try to keep your balance! Note: this is not an expert opinion just my personal views & suggestions based on research and observations I’ve made over time. This entry was posted in Parenting and tagged Attention deficit disorder, Attention deficit hyperactivity disorder, iPad, iPhone, IPod Touch, Netflix, Nook, Television. Bookmark the permalink.